How do you boost soil water content and soil health without irrigating? Best cover it with a layer of straw, a new study concludes. Farmers in China's Loess Plateau have for decades used both plastic and straw as a soil cover, or mulch, between crops. Much of the region's agriculture, of which corn is a large part, is dryland; the crops depend solely on seasonal rainfall. Dry spells can hurt crop growth and yield. So the two mulches—both inexpensive and readily available—are used to stop water loss from evaporation and keep soil warm. Although the mulches had been in use since the 1970s, "there were no studies being done about the effect of mulching on soil quality, soil health, and carbon sequestration," said Upendra M. Sainju. Sainju is a soil scientist at the USDA-ARS Northern Plains Agricultural Research Lab in Montana. 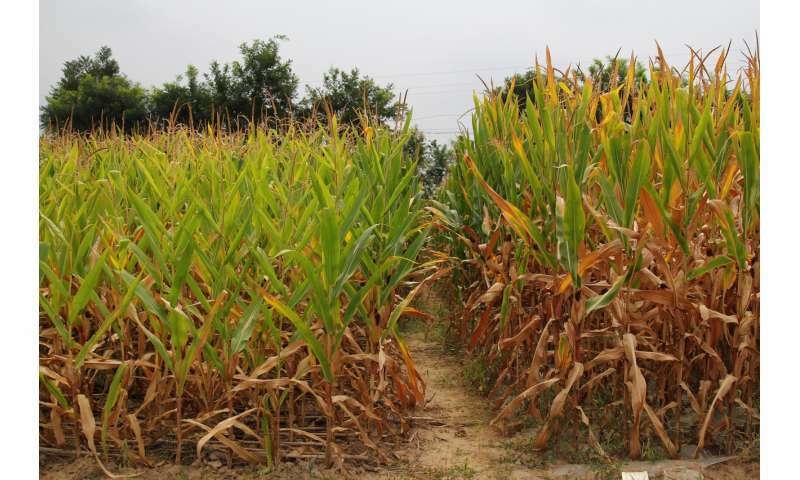 To investigate this, as well the mulches' effects on corn yields, the scientists designed a five-year experiment in which they compared straw mulch, plastic mulch, and no mulch. 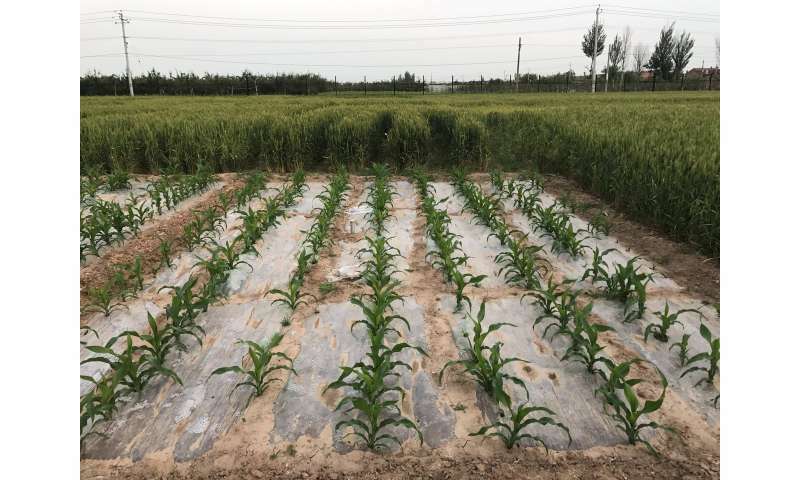 At their test plots at the Changwu Agro-Ecological Station, they covered the soil in May and removed the mulches when the corn was harvested in October. They took soil samples at the end of each season to analyze carbon. The scientists also compared corn yields between the different plots. On average, corn yield was highest in the plastic mulch, by 21 to 25 percent. Straw mulch also increased yield compared to bare soil, but only by five percent. What could be responsible for this difference? Since straw is high in carbon, decomposer microbes feed on free nitrogen in soil to balance their diet. This takes nitrogen—a key plant nutrient—away from the corn, affecting its yield. However, soil organic carbon was highest in the straw mulch plots. This is desirable because carbon-rich soils are better at removing greenhouse gases from the air, said Sainju. Higher-carbon soils also hold more nutrients and have a cookie crumb-like structure. Both of these qualities benefit crops. In the plastic mulch plots, the extra water boosted microbial activity. The hungry microbes consumed soil organic matter, converting it to carbon dioxide in the process. Using up the soil carbon this quickly reduces the ability of soil to act as a sink for carbon. "We thought that the plastic mulch would be better because it increases soil moisture," said Sainju. "The result was surprising in the sense that if you have too much water it increases the microbial activity, which can break down organic carbon." Building soil carbon is an important long-term goal worldwide, especially in China. Farmers in China can earn money from carbon credits when they improve soil's ability to store carbon. This makes straw the winner, according to the researchers. Although straw mulch increased microbial activity that used nitrogen, growers can adjust nitrogen fertilizer use to help balance out the processes. This will increase soil carbon and create high yields. Love this article, because I've recently (past couple of years) been mulching blocks of straw for the garden (to make it soft and fluffy). I think I'm on the right track.